Published on Tuesday, December 19, 2017. Susan Skarsgard, the archive manager of the General Motors Design Archive & Special Collections, says that her mission is to get people to “think new about old.” The company has been in existence for more than a century, so there is a long history to draw on. The archive, which is not open to the public but rather directed at GM employees in Detroit, features exhibitions on chapters of the company’s development, on the evolutions of certain models of cars, and on particular designers who have helped make the brand iconic among car enthusiasts the world over. The archive’s latest exhibition focuses not on designers, but on makers: the often-overlooked craftspeople integral to the development and realization of an idea that otherwise might never leave a blueprint. 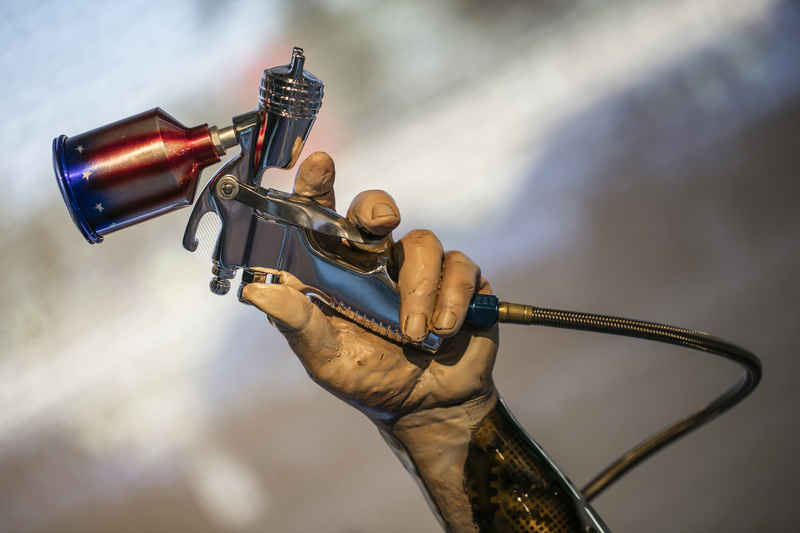 “Hands On: The Art & Craft of Design” celebrates the wood, metal, and clay workers; the painters and trimmers; the sculptors who make the design of an automobile possible. Some of these disciplines – such as rapid prototyping, serial lithography, and 3D-printing – are relatively new, but many have existed for decades. “The hand skills that are involved in sculpting [clay models of] vehicles are really the same as they’ve been for the last 60 years,” Skarsgard says. 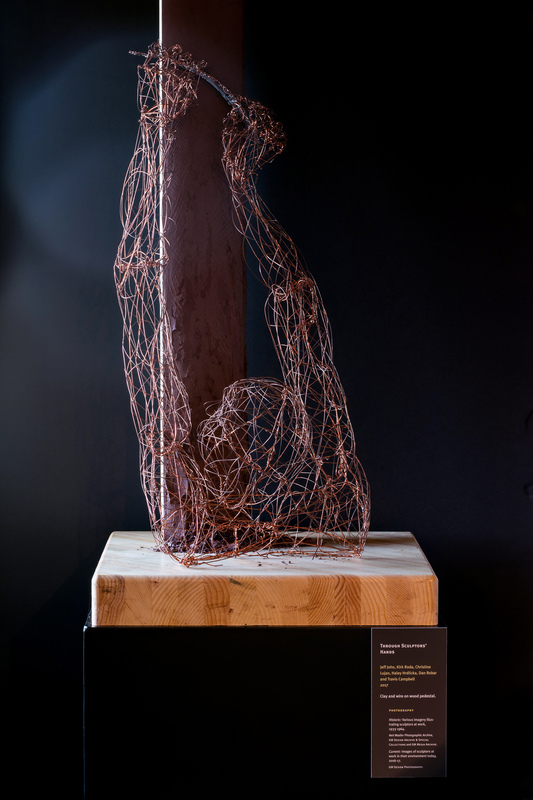 In addition to showing examples of different disciplines in an extensive series of historical photos, the exhibition features one original sculpture from each department. Each piece features hands prominently, giving just due to the artisans behind the work. The trim department, for example, provided an outstretched hand made of tiny spools of thread; the paint department offered an arm holding a spray gun aloft. Skarsgard notes that many of the people featured in “Hands On,” both from decades past and from the present day, have arts backgrounds. “By and large, most of the sculptors that I know are artists in their real life,” she says. “But of course, what they do at General Motors is very specialized and requires a highly disciplined set of skills.” With this exhibition, those specialists get their time in the spotlight – in the hopes that more people follow in their footsteps. Elly Gale's Tying It Together incorporates bobbins of thread on an upholstered fabric base, celebrating the trim department. 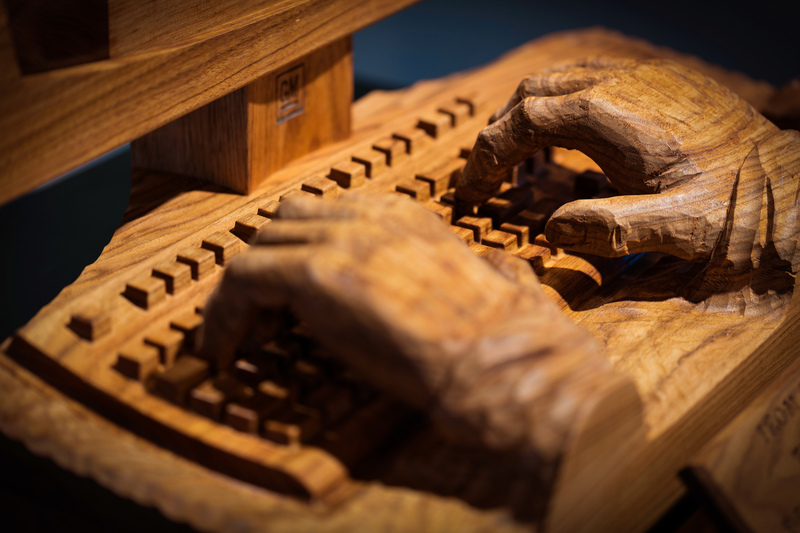 From Concept to Reality...Through These Hands, made by woodworkers John Creek, Bill Cooper, Don McGuire, and Paul Warner, shows the intersection of handwork and technology. 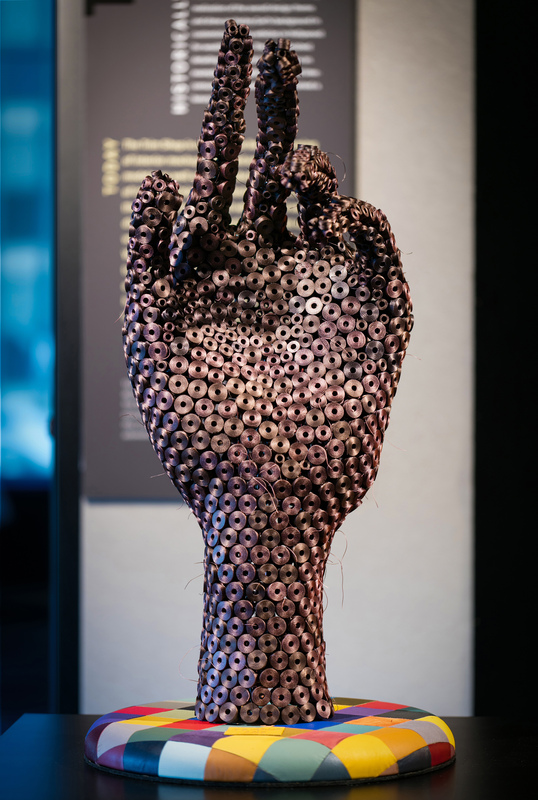 Made by six GM employees out of clay and wire, Through Sculptors' Hands exemplifies the exhibition's project: to celebrate the people whose work doesn't shine on showroom floors. Adam Reno and Jim Ciarkowski's The Terminator gives the paint department action-hero treatment.